I am somewhat new to letterpress. 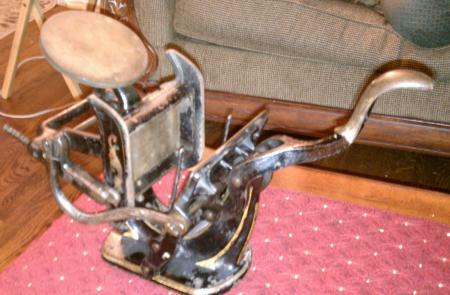 I have obtained a small 3x5 press (with chase) and Lydian font (14 pnt). 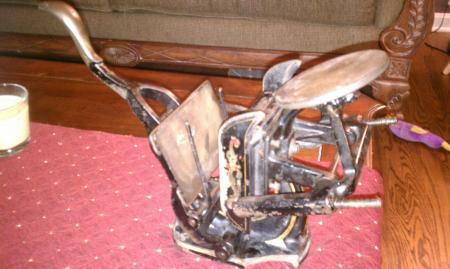 I am eager to get started but stalled, as I don’t know too much about my press. Attached are some photos, please help me identify the make/model. 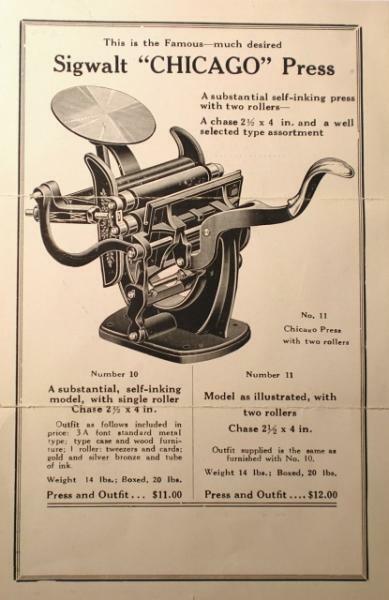 I was told it was a Baltimore, but there are no markings and when I search google for “baltimore letterpress” I’m sure you know what comes up…not it. Also, I need a quoin and key and I have searched ebay for this, haven’t had any luck. Do I need a certain size since my press is 3x5? Are there any other places for such supplies. Any help is greatly appreciated. It’s hard to tell in your photo 0071, but I think I see screws in the bottom edge of the chase. If so, and there are also screws in one side, I’d suggest using them instead of quoins (you’d need two, or four, depending on what kind you get — the old-fashioned wedge quoins are in pairs). You’ll need two pieces of steel about 5/8 inch by 2-3/4 (1) and 4-3/4 (1) inches by 1/8 inch thick. Place them against the screws and build the rest of the form to fill the chase, then tighten the screws against the steel to lock up. This is the system many such small presses, including the Kelsey 3x5, use in place of quoins. Hi That is a Sigwalt Chicago number 10 it was a copy of the baltimore. And Bob is right, lift the chase out and use the screws on the bottom of it to lock your type in. I have new rollers listed on here and E-bay for it, Look me up when your ready. Good Luck with the press! I have two types of MIDGET quoins and key perfect for your press. Reply and I will send my pricelist for beginners. Also have many good other items and free technical help should you need it. craft I love so much! Been in it over 50 years.